This short video of Little and Wildebeest Willie clearly illustrates how easy it is to become attached to these animals and deeply care for their well-being. Bushbuck family comes to visit daily. They always stand at the foot of the veranda steps to be away from other wildlife that "steal" their pellets and veg. 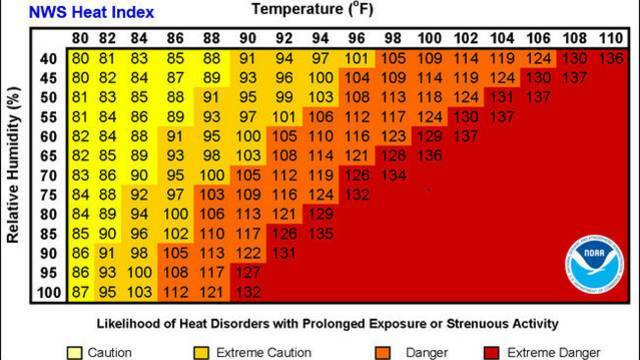 "The heat index is a measure of how hot it really feels when the effects of humidity are added to high temperature. 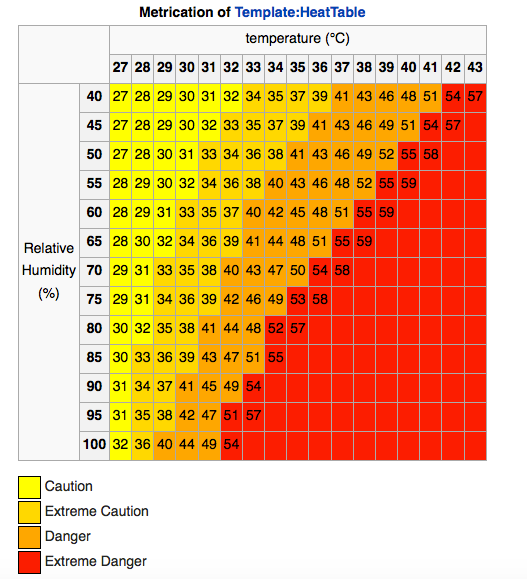 To alert the public to the dangers of exposure to extended periods of heat and the added effects of humidity a Heat Index table is used to correlate measured temperature and humidity into an apparent temperature. This website offers graduated heat maps showing this temperature. Based on this morning's temperature of 36C (97F), with humidity at 45% the heat index so far today is 41C (105.8). Of course, if we lived in the US or many other countries, we'd have full house air conditioning or at the least, a few window units capable of cooling the living areas and bedrooms. But, we're not in the US or another country where aircon availability and use is common during extreme heat and humidity. Even last night, with the bedroom's excellent unit on, it never quite cooled down enough, especially when the outdoor temp hovered around 32C (90F). With these wall units, it's important not to lower the temperature too much or the unit can "freeze up." Then, we'd have no air at all for the remainder of the night which would be a much worse scenario that sleeping without a cover. It's easy to tell the wildlife is also feeling it. We had no less than eight warthogs sitting in the cement pond at varying times of the day. The hardest period for me was when the power went out from 1300 hours (1:00 pm) to 1530 hours (3:30 pm) the hottest time of the day. Every so often during the day when the heat is exhausting, I may spend 20 or 30 minutes in the bedroom with the aircon unit on (always turning it off and on while I'm in the room, never leaving it running when we're not). Yesterday afternoon, when that option wasn't possible during the power outage those two and a half hours were by far the most uncomfortable I've experienced. Tom sat outdoors shirtless which helped him. But, us girls...that's another matter. He says he felt much hotter when we were in Abu Dhabi in 2013 and the temperature was a dry 50C (122F). However, I'll always remember it being extremely uncomfortable when we were dressing to enter the Sheikh Zayed Grand Mosque (the White Mosque). 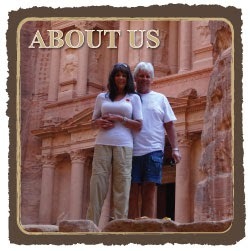 Here's our photo from that date and the link is located here. Definitely not my most flattering photo. Tom looks great! We were standing in front of the architectural scale model. After we posed for this picture, a security guard rushed over telling us we are not allowed to touch one another in the mosque. Of course, we complied. Well, we could spend all day whining about the power outages, yesterday's water outage (back on now), the heat and humidity. Today, we'll be a little smarter when and if the power is scheduled to go out (or even if the power doesn't go out) at 1300 hours (1:00 pm) until 1530 hours (3:30 pm). The car's aircon is spectacular. We'll jump in the red car and go for a drive in the park for the two and a half hours. Once we return to the house, we'll shower (water providing) and dress for tonight's dinner at Jabula Lodge & Restaurant (we never tire of this wonderful place) with Rita and Gerhard (we never tire of this wonderful couple) who are returning from Germany today. We'll be thrilled to see them, as always. Stay cool, or in many cases stay warm, wherever you may be in this world. New friends Lisa and Barry invited us to dinner in the private wine room for one last night together on the ship. They were disembarking the following day while we continued on for another 15 nights. For more photos, please click here.